Ever since a food blogger published an article early this fall talking about her shock and horror at discovering that Libby’s canned pumpkin was in fact, squash, Libby’s has been inundated with questions from panicked pumpkin pie bakers. Turns out the whole kafuffle was one of preferred parlance: The word ‘pumpkin” has no biological or scientific meaning. Part of the cucurbita genus, “pumpkins” can legitimately be called squash, pumpkin or gourd depending on where you happen to live. To help abate the canned pumpkin panic: Libby’s “pumpkin” is packed from their pale-skinned, proprietary Dickinson cucurbita cultivar. So no worries, people. On the home-made front? 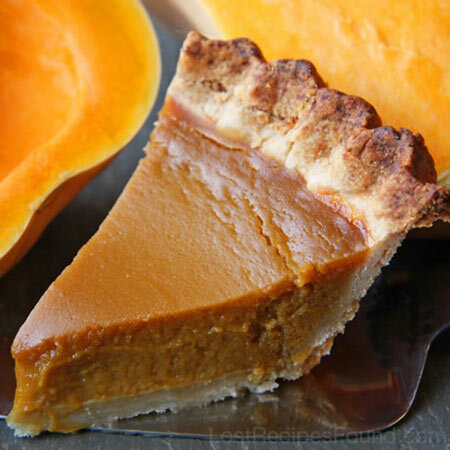 Lost Recipes Found did its own experiments years ago and found little difference between pies made with pumpkin, butternut squash, garnet yam, or sweet potato. You can make a stellar pie using the whipped soft flesh from any of these ingredients. 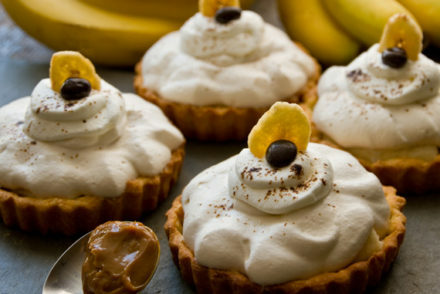 Tucked into a home-made crust and topped with whipped cream they’re all amazing. 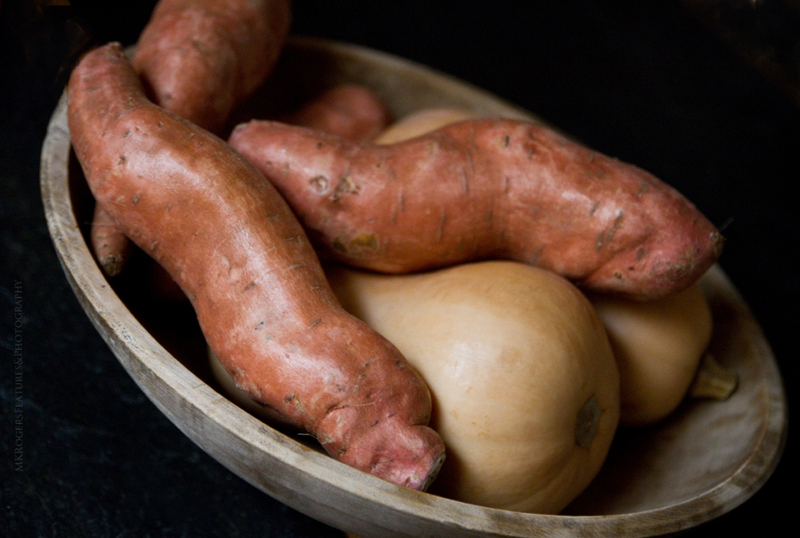 In our comparison tests, yam had the best color & texture–very orange, smooth & creamy. But butternut squash had the best flavor–more mild than pumpkin. Squash was also less-sticky with a smoother top than the sweet potato pies (those cracked on top.) But really, all of the fillings worked well using some variation of cinnamon, ginger, and nutmeg with brown sugar, corn syrup, evaporated milk and eggs. Our spiced squash pie filling is based on a recipe I found in my mom’s stuff. The inclusion of a little orange juice adds brightness to the traditional spice trio of ginger, cinnamon and fresh-grated nutmeg. 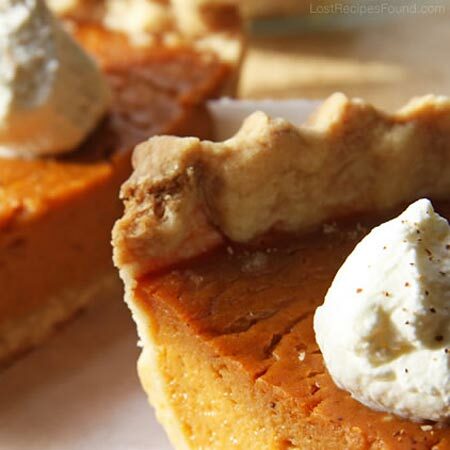 The sweet potato pie is another longtime-favorite. For a lighter-textured pie? Separate your eggs, whisk the yolks in with the other filling ingredients, and save the whites to the end: Whip whites until soft peaks form and fold with a gentle, over/under motion into the filling before pouring into the pie crusts. Q: What’s the difference between pies made with pumpkin, butternut squash, garnet yam, and sweet potato? A: Not much. You can make a stellar pie using the whipped soft flesh from any of these ingredients. Make crust: Sift flour, sugar and salt together. Cut butter in to flour mixture with two knives or fingertips until mixture resembles wet sand with some pea sized bits in it. Add evaporated milk (or cream) 1 Tbsp at a time (only use what you need to get the dough to hold together.) Mix with a fork until pastry begins to pull together. Turn pastry out onto sheet of plastic wrap and form into a ball. Cut in half. Wrap each half of the pastry in plastic wrap–flatten into two disks. Refrigerate for 1 hour. Make butternut squash: Cut one large, or two small butternut squash in half, lengthwise. Scoop out seeds and strings that come away without too much effort. Invert squash in large baking dish and add 1/4 cup water. Cover dish with foil. Bake at 325 for one hour, or until soft when pierced with a fork. Cool. When cool enough to handle, discard any remaining seeds/strings. Scoop out flesh and mash, then whip until very smooth. 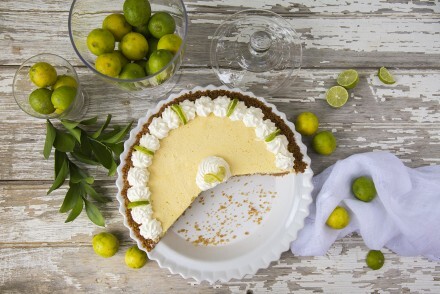 You will need 3 cups of whipped squash to make two pies. Make pie filling: In a bowl, mix together sugar, salt, cinnamon, ginger and nutmeg. Set aside. Beat eggs and syrup in the mixer bowl of a stand mixer on low for 2 minutes. Using a spatula, add squash, orange juice and evaporated milk and fold in for a minute. Turn mixer on very low speed to keep everything from sloshing out of the bowl. Add sugar and continue to beat until smooth. Set aside. Assemble pies: Preheat oven to 375. Spread counter with two large, overlapping pieces of plastic wrap, or parchment. Place a disk of chilled pie dough on the center of the wrap. Cover with two more large, overlapping pieces of plastic wrap, or parchment. Roll dough out to 11-inch circle. Remove top plastic sheets; invert pastry into pie plate, easing it in and lightly pressing out any air pockets. Form a decorative, stand-up-rim of pastry. Repeat again with second pie-dough disk in second pie plate. Pour filling into pie crusts. Bake at 375 for 40 to 45 minutes until filling is firm. Cool. Serve with lightly-sweetened whipped cream as garnish. Make pie filling: Blend eggs, sweet potatoes, sugar and syrup well. Sift in salt, and spices. Blend. Mix in milk. 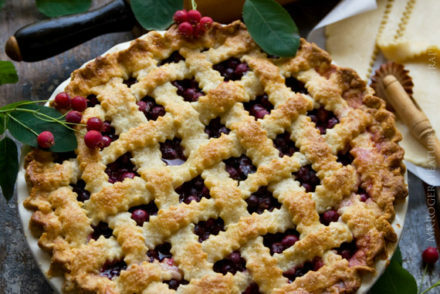 Assemble pies: Spread counter with two large, overlapping pieces of plastic wrap. Place a disk of chilled pie dough on the center of the wrap. Cover with two more large, overlapping pieces of plastic wrap. Roll dough out to 11-inch circle. Remove top plastic sheets; invert pastry into pie plate, easing it in and lightly pressing out any air pockets. Form a decorative stand-up rim of pastry. Repeat again with second pie-dough disk, rolling it out and placing in second pie plate. Pour filling into pie crusts. Sprinkle with pecans, if using. Bake at 375 for 40 to 45 minutes until filling is firm. Cool. Serve with lightly-sweetened whipped cream as garnish. For a lighter-textured pie? Separate your eggs, whisk the yolks in with the other filling ingredients, and save the whites to the end: Whip whites until soft peaks form and fold with a gentle, over/under motion into the filling before pouring into the pie crusts.